My One Month Book: Camp NaNo! Hey everyone! I just found out that we don't have to wait as long for NaNoWriMo to start! If you're like me you are already counting down for NaNoWriMo 2013 :P BUT! Now I am counting down for April! Let me introduce to you Camp NaNo!!! 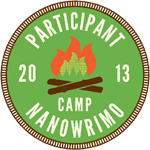 Camp NaNo is in both April and July 2013! So you don't have to worry about those huge word count goals, you get to set it! It can be from 10,000 to 999,999 words. This time NaNo doesn't just limit you to novels but now you can write a memoir, blog series, frenzied script or anything your creative heart desires! 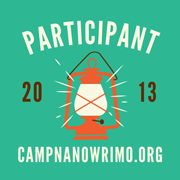 You can visit campnanowrimo.org to learn more. I can't wait to see who my cabin mates are! I hope you join me in this challenge too!